We are on our way to school. Coco’s sitting in her booster seat, wearing her Princess Jasmine glasses with her nose in Harry Potter and the Sourcerer’s Stone. Thank you, J.K. Rowling. My second grader has seen the movie, knows the story, can recite all the Hogwart’s jargon, but until now, she hasn’t been interested in reading without a threat or a reward. This week, she’s discovered the thing the rest of us already know. Reading is fun. We love Harry at our house too! 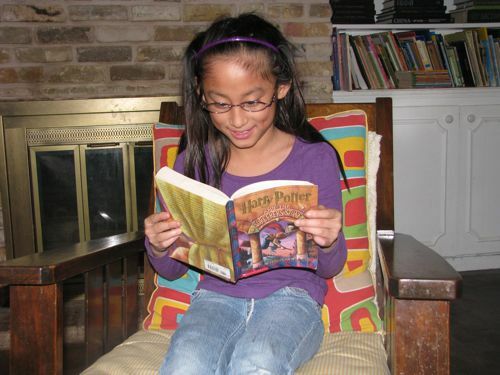 Audra is on Book 6 and right now everything revolves around Harry Potter-homepage is the Harry Potter lexicon :). Kind of nice that she looks to Hermione as a role model as well. Another series we really enjoy and she got from Santa is Percy Jackson and the Olympians by Rick Riordan. Very humorous-lots of fun Greek Mythology inserts. Might give those a try. Cherry considers herself a Harry Potter expert, but this is Coco’s first chance to read the story. Cherry loves the Percy Jackson stories and can’t wait to see the new movie. My kids and I loved the HP books. It was really fun to all be into a series at the same time. And my 12 year olds love the Percy Jackson books too. We are looking forward to the movie! Oh, and isn’t it great when kids find that book that turns them into readers? Lauri, I’m probably pushy. Her big sister reads so much. Coco tends toward rebellion, but she loves a good story! So, yes. I’m excited to see her loving books. For a long time my son didn’t care about reading. He’d read the HPs when they came out. NOW he spends his extra money on books! My class is loving The Lightning Thief. We’re in a race to finish it before the movie opens! Oh, and I meant to say, we were reading a story called The Bridge Dancers from our reader and my kids noticed the beautiful use of language. It was cool! We’ll have to check that out! My oldest is the same age as the kids you teach, I think.